Recently I read an article by China Acheru titled ‘7 minutes with China: It’s time to gate crash the World Cup Party’, and I thought I should put on something that should depict what our World Cup party should look like without the gate crashers. I honestly think that from the crop of players that executed the World Cup Qualifiers from the second round tie against Swaziland, (remember Nigeria drew bye for the first round) to the last match in the group phase against Algeria in Constantine, only fifteen of them for me at this moment are certain to be on the plane to Russia. I have put into consideration the players form for club and country, players versatility, what we need in the national team and of course being a regular in a top club is obviously a huge advantage. 1. Ikechukwu Ezenwa (Enyimba FC) – The CHAN Eagles skipper for me is the only goalkeeper certain to be on the plane to Russia. He has not really had a commanding display for the Eagles and the way he flaps at crosses has had some fans clutching their chest. 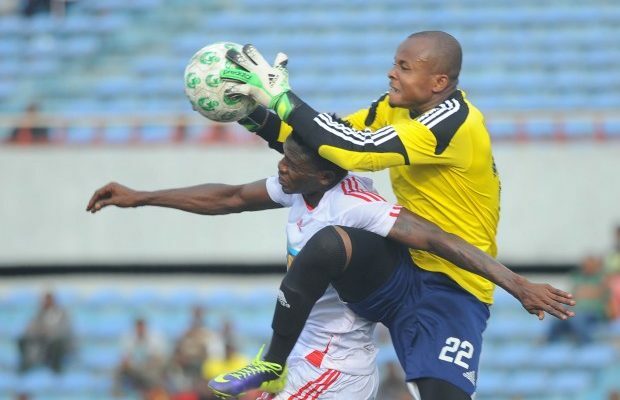 But with some tough games in the CHAN to come this month and some more in the CAF Champions League with Enyimba, I feel Ezenwa will be ready to man the post in Russia. Francis Uzoho and Daniel Akpeyi look like the other choices for the Mundial but their slots are not certain as the return of Enyeama will spell doom for either of them not to mention the purported return of Austin Ejide and Dele Ayenugba. 2. William Troost Ekong (Buraspor, Turkey) – A regular in the Eagles defense these days forming a lovely partnership with Leon Balogun a pair that have been christened ‘Oyinbo Wall’ by fans. Ekong is not a defender in the mold of former Eagles captain Uche Okechukwu or does he possess the ‘ruggedity’ of Taribo West. Yet his height, pace, incisive tackles and interception has endeared him to Nigerians. He was also shortlisted for the CAF player of the year award and is in the CAF 11 for 2017. A sure banker for Russia. 3. 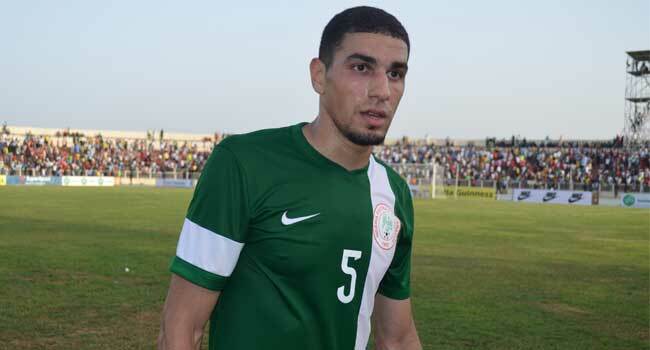 Leon Balogun (Mainz 05 Germany) – The other half of the ‘Oyinbo Wall’ should be in Russia if he stays out of injury. For a player who wore the arm band in the last 2018 World Cup Qualifying game against Algeria, you should think is certain to make the party. Nagging injuries has been his bane and Nigerians will be praying that he avoids injuries heading to the World Cup. Good in the air and quite rugged, though still suspect when it comes to his pace and if he is up against skillful players. 4. Chidozie Awaziem (FC Nantes on loan from FC Porto) – Awaziem has been a regular for Claudio Ranieri’s Nantes in the French Ligue 1 and has churned out beautiful performances. The young defender’s Eagles career got off to a shaky start in the 2019 AFCON qualifier against South Africa in Uyo deputizing for the injured Leon Balogun. 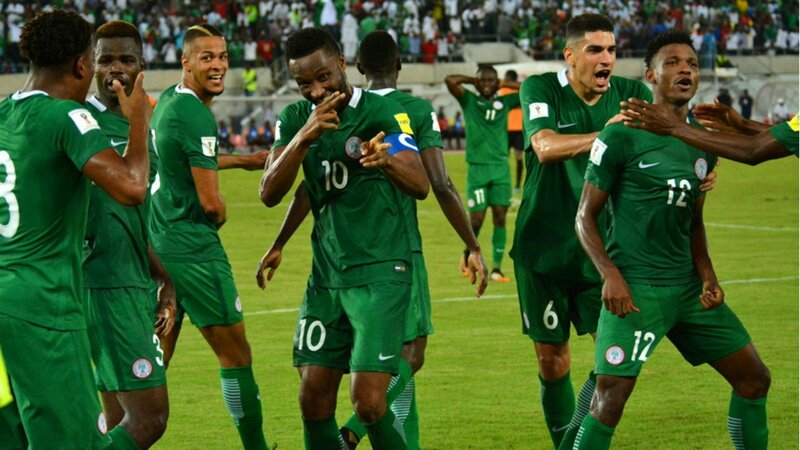 The Eagles lost that game 2-0 and some fans attributed the loss to coach Gernot Rohr’s preference for Awaziem instead of a more experienced Kenneth Omeruo. Awaziem had another chance to impress his doubters and he took it with both arms when he gave an outstanding performance in the 4-2 friendly win against Argentina in Russia. He seems to have gained Rohr’s trust so I’ll put him on the plane to Russia either to deputize for the ‘Oyinbo Wall’ or as one of the central defenders if Rohr chooses a 3-5-2 formation. 5. 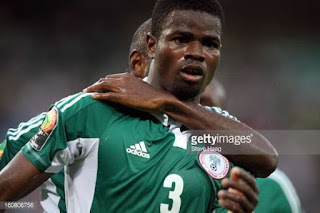 Elderson Echeijile (Sivaspor, Turkey on Loan from Monaco) – Eagles left back at the last World Cup in Brazil has had age and loss of form affect his career. Little wonder he was sent on loan to Turkey from French Champions Monaco. For want of a better player with the needed experience I think Echeijile will make it to Russia although fans are highly concerned with his lack of pace. 6. Shehu Abdulahi (Anorthosis Famagusta, Cyprus) – The player at the center of the fiasco that bedeviled Nigerian football after FIFA fined the Nigerian Football Federation for fielding him in a dead rubber World Cup qualifier against Algeria. He happens to be a mainstay in the Eagles after making the right fullback position his own with eye catching performances one of such earning him the man of the match award in the game against Zambia that sealed qualification to Russia. The likes of Ola Aina, Tyronne Egbeuhi, Edoho and Kenneth Omeruo and the gate crashers will have to slog it out for the remaining defensive spots. 7. 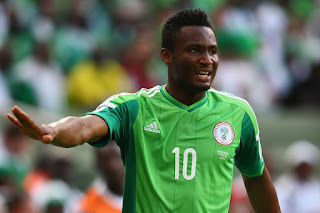 Mikel Obi (Tianjin TEDA, China) – Captain fantastic is obviously one the first names on the list of Russia bound players. With 82 caps for the National team his experience and leadership is something the Eagles will need in Russia. Ask Sampson Siasia and Dream Team 6 players. Rohr’s Eagles have lacked cohesion whenever skippo is not available and his hold up play and distribution is second to none in the team. He must be in Russia. 8. Ogenyi Onazi (Trabzonpor, Turkey) – One of the few really experienced players in the Eagles, Onazi place on the plane to Russia is certain. A regular with the club and the Super Eagles since he made his debut in 2013. 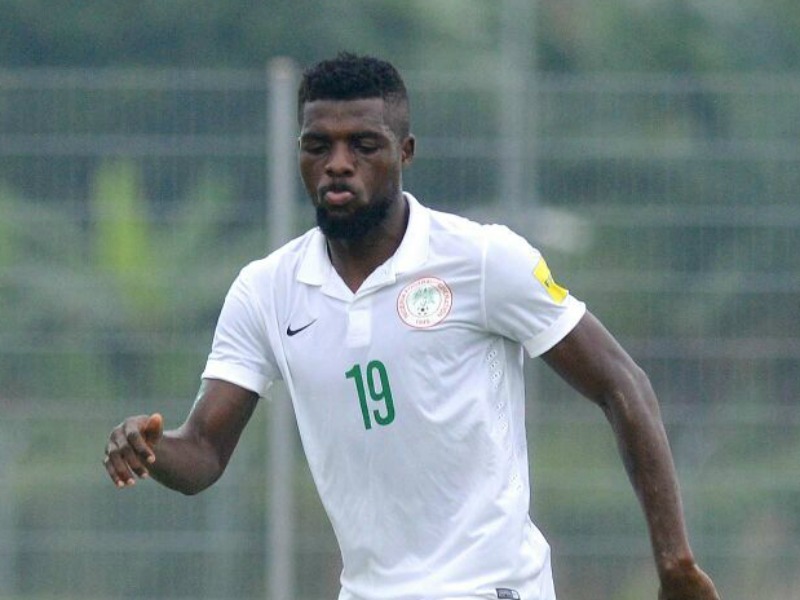 Some pundits feel his place in the Eagles starting eleven is threatened with the recent performance of John Ogu but certainly not his place on the plane. 9. Wilfred Ndidi (Leicester City, England) - Wilfred Ndidi has been a super regular for his club Leicester City turning up top performances week in week out earning accolades from football pundits the world over. The Eagles certainly do not have someone at his level in his position. A certainty for Russia. 10. 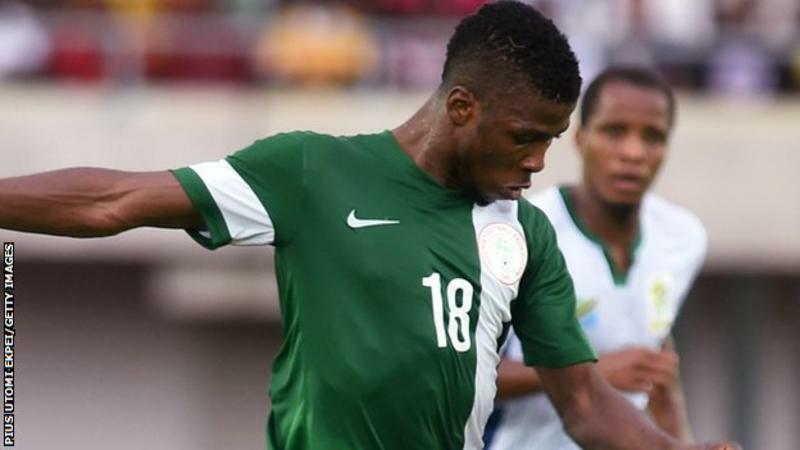 John Ogu ( Hapoel Ben Sheva) - Since making his debut on March 4, 2013 in a 2014 World Cup qualifier, coming on as an 89th minute substitute for Victor Moses in a 1-1 draw against Kenya. John Ogu has been in an out of the Eagles team, making the list for the Confederation cup in 2013 but missing out of the World Cup the next year. With just 16 caps and 2 goals in the Eagles colours, Ogu’s man marking abilities will come in handy as a backup for the regular midfielders. Ogu I feel has a better chance than Mikel Agu and Oghenekaro Etebo who disappointed the last time out. 11. Victor Moses (Chelsea, England) - You can’t be a regular for Chelsea in England and don’t make it to the World Cup for Nigeria. Moses has been the Eagles best performer in recent times and his ability to track back and defend is an added advantage to the team. Playing wing back for Chelsea has remarkably improved his game and who says Rohr cannot use him in that position at the World Cup. 12. Alex Iwobi (Arsenal, England) - Many say being Jay Jay Okocha’s nephew has helped his course in the national team, but you can’t be a first team player for the Gunners and not be part of a Nigerian team begging for World class talents. Iwobi’s pace and skill added to his versatility sure gives him an edge and he would be in Russia, of course he scored the goal to sealed qualification. 13. Kelechi Iheanacho (Leicester City, England) – Touted as the golden boy of Nigerian football following his exploits at the U 17 World Cup at The United Arab Emirates 2013 where the Golden Eaglets won gold and Kelechi was voted player of the tournament; and his signing for Manchester City. The coming of Pep Guardiola limited his first team appearance at the Etihad and a move to former champions Leicester has failed to improve his playing time. He may have lost his starting place in the Eagles but his goal scoring exploits in the team cannot be over looked. 14. Moses Simon (KAA Gent, Belgium) – The skillful left winger is a joy to behold in a one on one situation. A regular at Gent and the Eagles also good in dead ball situation. Eagles spot on the left wing will be a straight fight between him and Iwobi with Victor Moses certain to get the nod for the right wing. 15. Odion Ighalo (Chanchun Yatai, China) Odion Ighalo scored himself backed to reckoning with the Eagles after his goals in China and Eagles failure to beat South Africa in Uyo led to Gernot Rohr recalling him. The big striker is comfortable with both feet and can also hold up play. With Henry Onyekwuru’s injury likely to rule him out, Kayode Olarenwaju, Ahmed Musa, Anthony Nwaekame, Anthony Ujah, Brown Ideye, Isacc Success and Obafemi Martins should jostle for the remaining slots. Barring injuries and loss of form these fifteen for me are certain to be in Russia, gate crashers should take up three to five spots while other non-starters will complete the world cup party.